Knowing how to restore system image from USB can help you a lot in system image recovery. AOMEI Backupper is the most suitable software to solve this problem. A system image is a complete system backup. 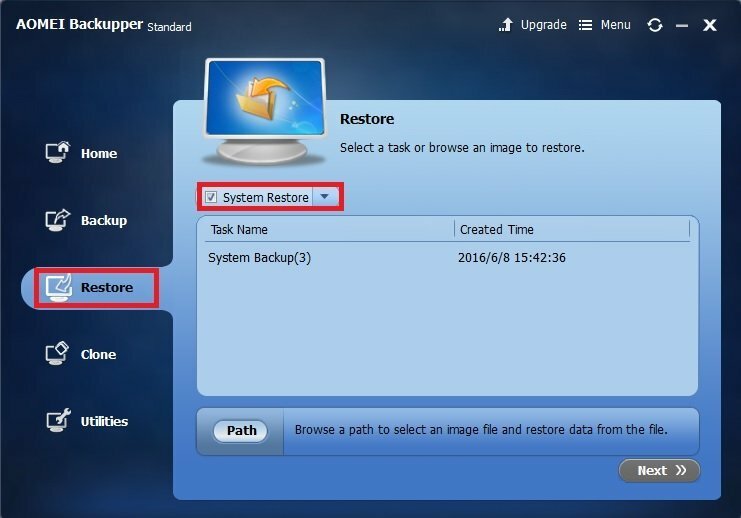 In the event that you are unable to start Windows or wish to restore your hard drives to a previous backup, you can use the system image recover program. The system image recovery will overwrite the entire contents of your hard drives with the contents of a previously created system image. USB, short for Universal Serial Bus. USB was designed to standardize the connection of computer peripherals to personal computers, both to communicate and to supply electric power. It has become commonplace on other devices, such as smartphones, PDAs and video game consoles. USB has effectively replaced a variety of earlier interfaces, such as parallel ports, as well as separate power chargers for portable devices. After talking the function of system image recovery, we need to find out the way to restore system image from USB. The first question may be how to choose a tool for restoring. All customers may strongly attach importance to the efficiency of restore function. Besides, the difficulty level of operation should be taken into account. And what means much to users is the cost of completing the process, including the cost in time, energy and money. 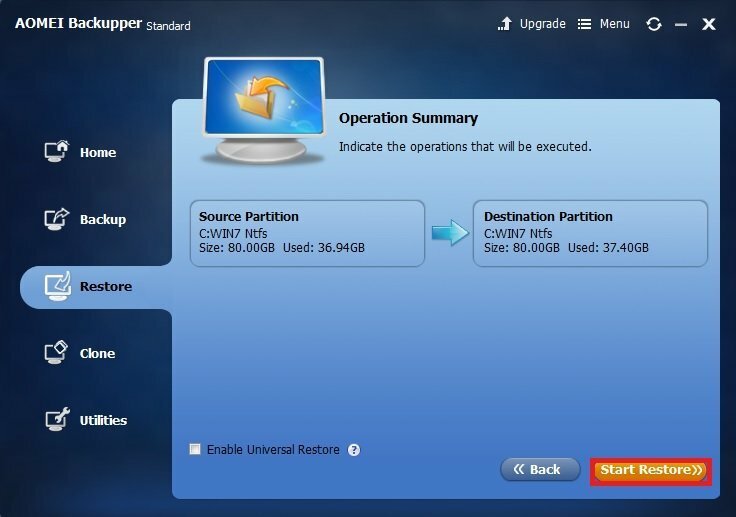 AOMEI Backupper is the most suitable tool for you to restoring system image from USB. 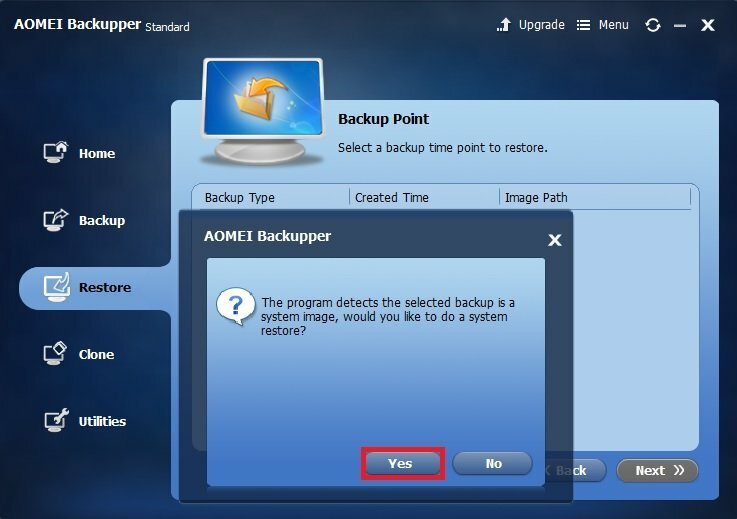 AOMEI Backupper has powerful restore function. Besides, its intellectual user interface enables the operation easy to learn. And what make customers excited may be the price of the software, you can use AOMEI Backupper to restore system image from USB without paying for it. All in all, choosing AOMEI Backupper as the tool of system image recovery is the wisest decision. Now we suppose that you have created system image to USB, and you also have created a system repair disc. The following is the detail of restoring system image from USB. Step1. Download AOMEI Backupper, install it. Plug the USB device which you stored system image. And plugging the system repair disc into the CD/DVD Rom so that you can boot into your Windows . Click Restore in the left of the main interface. Then Check the System Restore box. Step2. Click the Path to select the system image file. Step3. The program will pop up a prompt which says “The program detects the selected backup is a system image, would you like to do a system restore?”. Click Yes to continue the process. Step4. You will see a Operation Summary which indicates the operations that will be executed. Click Start Restore to begin the process. Click Finish after the restore is done. 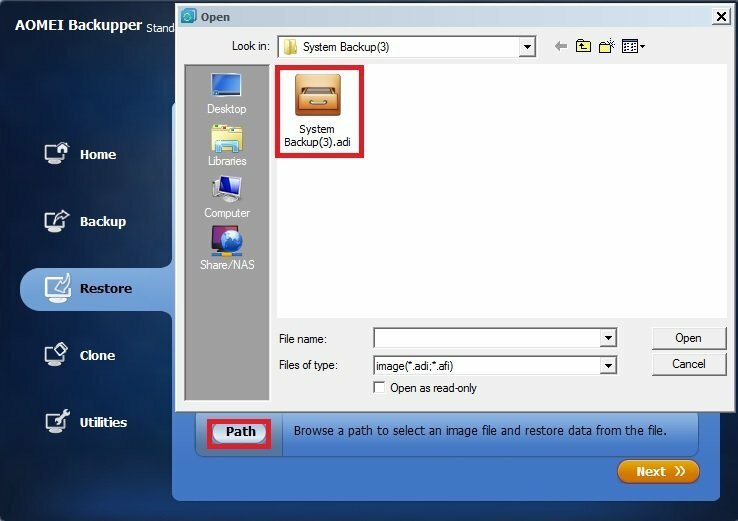 ● You can backup C drive to external hard drive with the backup function of AOMEI Backupper. ● Using AOMEI PXE Boot Tool, you can make the system bootable.